1. Preheat the oven to 200˚C, gas mark 6. Wash the potatoes, leaving the skins on, then cut lengthways into thick wedges. 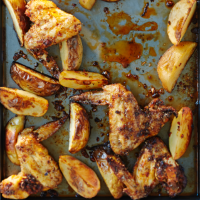 Put the wedges on a large baking tray, season and toss with the oil. Roast for 20 minutes, until starting to soften. 2. Meanwhile, mix all the rub ingredients together with 1 tbsp water until you have a paste. Pat the chicken wings dry with kitchen paper, then mix with the paste in a bowl until evenly coated. Season, then put on the tray with the wedges. Roast for another 35 minutes, until golden. This recipe was first published in Fri May 01 12:04:00 BST 2015.